Bernard Leach (1887-1979) was the most influential potter of the 20th century and has been described as the Father of British studio pottery. Bernard Leach was born in Hong Kong in 1887, but spent his first years in Japan, until his father, Andrew Leach, moved back to Hong Kong in 1890. Eastern culture and teaching were to have significant influence throughout Leach’s life and career. He attended the Slade School of Fine Art and the London School of Art, where he studied etching under Frank Brangwyn. Whilst studying he was once again influenced by Japanese culture and stories especially the writings of Patrick Lafcadio Hearn (1850-1904)who wrote a number of books including Glimpses of Unfamiliar Japan. Pictured: Bernard Leach (1887-1979) Tokyo, 1912 – A Raku albarello, a rare early work, with earthenware body decorated in blue, green, yellow and orange metallic oxides on a white crackled tin-glazed ground with bands of stylised leaf and foliage, signed BHL within a geometric cartouche and dated 1912, 20.7cm. high. Sold for £12,500 October, 2013 at Christies, London. In 1909 he returned to Japan with his wife Muriel (née Hoyle) with a view to teaching etching. In Tokyo he gave talks and attended meetings along with Mushanokoji Saneatsu, Shiga Naoya, Yanagi Soetsu and others from the “Shirakaba-Group”, who were trying to introduce western art to Japan after 250 years of seclusion. In etching, Satomi Ton, Kojima Kikuo, and later Ryusei Kishida, became pupils of Leach. Pictured: Bernard Leach (1887-1979) A large pie-crust earthenware dish, of white clay, formed over a hump mould, decorated with an onion seller in cream slip trailed over a red-brown slip ground, under a clear glaze leaving the edge and base unglazed, circular St. Ives seal to the base 35.3cm. diam. Sold for £9,375 November 2012 at Christies, London. About 1911 he attended a Raku-yakipottery party which was his first introduction to ceramics, and through introduction by Ishii Hakutei, he began to study under Urano Shigekichi (1851–1923), who stood as Kenzan 6th in the tradition of potter Ogata Kenzan (1663 -1743). Assisting as interpreter for technical terms was the potter Tomimoto Kenkichi, whom he had met already earlier. From this time Leach wrote articles for the Shirakaba. In 1913 he also drafted covers for Shirakaba and “Fyuzan”. Attracted by the Prussian philosopher and art scholar Dr. Alfred Westharp, who at the time was living in Peking, Leach moved to Peking in 1915, and returned to Japan the following year. In 1919 Hamada Shoji visited Leach for the first time. Leach received a kiln from Kenzan and built it up in Yanai’s garden and called it Tomon-gama. Now established as a potter, he decided to move back to England. In 1920, before leaving, he had an exhibition in Osaka, where he met the potter Kawai Kanjiro. In Tokyo, a farewell exhibition was organised. Pictured: Bernard Leach (1887-1979) Circa 1930 The large earthenware dish with pie-crust, formed over a hump mould, decorated in cream and reddish-brown slip trailed over a ground of dark brown slip with an abstract plant form, under a clear glaze leaving the edge and base unglazed, St. Ives seal to base 34.1cm. diam. Sold for £8,125 November 2012 at Christies, London. Leach returned to England in 1920 on the invitation of Frances Horne. Horne was establishing a Guild of Handicrafts within the existing artist colony of St Ives in Cornwall. On the recommendation of a family friend, Edgar Skinner, she contacted Leach to suggest that he become the potter within this group. Leach and his wife Muriel were accompanied by the young Hamada Shoji and, having identified a suitable site next to the Stennack river on the outskirts of St Ives, the two established the Leach Pottery in 1920. They constructed a traditional Japanese climbing kiln or ‘noborigama’, the first built in the West. The kiln was poorly built and was reconstructed in 1923 by Matsubayashi Tsurunosuke. 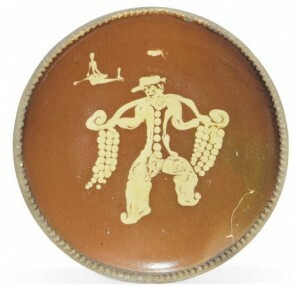 Leach promoted pottery as a combination of Western and Eastern arts and philosophies. 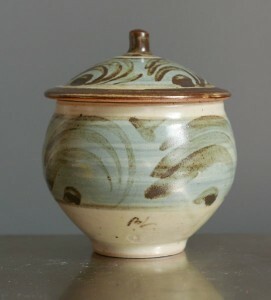 His work focused on traditional Korean, Japanese and Chinese pottery, in combination with traditional techniques from England and Germany, such as slipware and salt glaze ware. He saw pottery as a combination of art, philosophy, design and craft – even as a greater lifestyle. A Potter’s Book (1940) defined Leach’s craft philosophy and techniques, went through many editions and was his breakthrough to recognition. Leach advocated simple and utilitarian forms. His ethical pots stand in opposition to what he called fine art pots, which promoted aesthetic concerns rather than function. Popularized in the 1940s after the publication of A Potter’s Book, his style had lasting influence on counter-culture and modern design in North America during the 1950s and 1960s. 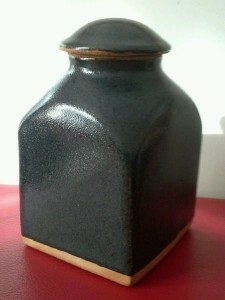 Leach’s pottery produced a range of “standard ware” handmade pottery for the general public. 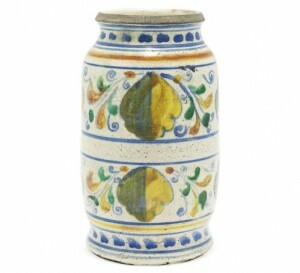 He continued to produce pots which were exhibited as works of art. 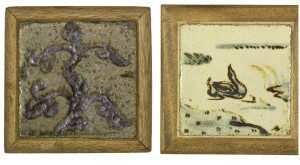 Pictured: Bernard Leach (1887-1979) Circa 1926-30 Two stoneware tiles mounted as teapot stands, the first olive-grey with white speckles decorated with a ‘Tree of Life’ in iron oxide; the second cream decorated in cobalt and iron oxide with a duck on a lake, both with four impressed S/Iseals to the back, and the ‘duck’ tile signed in iron oxide BL at the bottom right of the face 12.5cm. and 13.5cm. high. Sold for £2,250 November 2012 at Christies, London. Many potters from all over the world were apprenticed at the Leach Pottery, and spread Leach’s style and beliefs. His British associates and trainees include Michael Cardew, Katherine Pleydell-Bouverie, David and Michael Leach (his sons), Janet Darnell (whom Leach married in 1956) and William Marshall. His American apprentices include Warren MacKenzie (who likewise influenced many potters through his teaching at the University of Minnesota), Byron Temple, Clary Illian and Jeff Oestrich. He was a major influence on the leading New Zealand potter Len Castle who travelled to London to spend time working with him in the mid-1950s. Another apprentice was the Indian potter Nirmala Patwardhan who developed the so-called Nirmala glaze based on an 11th-century Chinese technique. Many of his Canadian apprentices made up the pottery scene of the Canadian west coast during the 1970s in Vancouver. 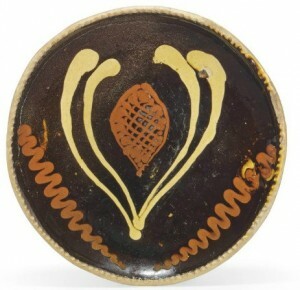 The Cypriot potter Valentinos Charalambous trained with Leach in 1950-51. He continued to produce work until 1972 and never ended his passion for travelling, which made him a precursor of today’s artistic globalism. He continued to write about ceramics even after losing his eyesight. The Victoria and Albert Museum in London held a major exhibition of his art in 1977. The Leach Pottery still remains open today, accompanied by a museum displaying many pieces by Leach and his students.